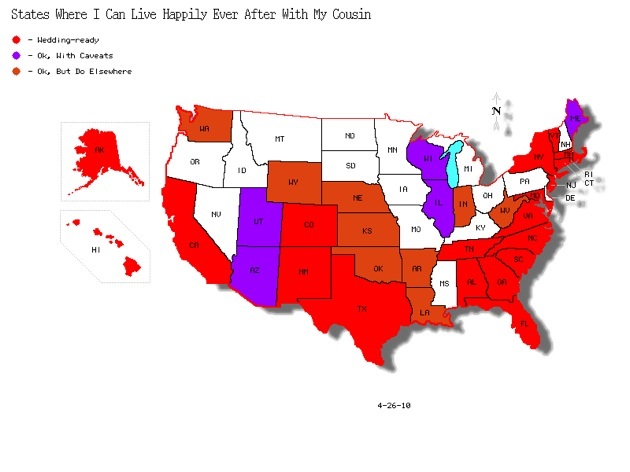 As a research nerd, and kind of a weirdo, writing a post about gay marriage inequality and sulking about how many states I can’t marry my ex-girlfriend in got me wondering: Hm, how many states could I marry my cousin in? Turns out the answer, despite all that stigma and a slightly increased risk of birth defects in offspring, is, most states. Some have caveats, like that we wouldn’t be allowed to get married unless we were really old or unable to reproduce, and some wouldn’t let us get married but WOULD legally recognize our marriage as long as we had the ceremony somewhere else. Way to not extend that courtesy to the gays, Arkansas, Indiana, Kansas, Louisiana, Nebraska, Oklahoma, Washington, West Virginia, and Wyoming! I am absolutely not saying that I think first cousins shouldn’t be allowed to get married. What I am saying is, I made a map.